Many of you may or may not know that Chicago is known as Candy Capital of the World, second nickname after the Windy City. 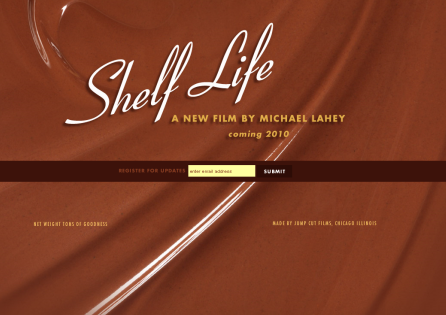 Well filmmaker Michael Lahey is filming his new documentary “Shelf Life”. It is based on the Chicago candy industry, and his families ties to it. Here is the full synopsis of the documentary which is due to debut in 2010. You can visit the website to get updates if you’re interested! City of Broad Shoulders. Hog Butcher to the World. The Windy City. Second City. Chicago has held several nicknames over the years, but one lesser-known moniker is Candy Capital of the World, a title Chicago has maintained for more than a century. Mars, Brach’s, Wrigley’s, and Jelly Bellies, to name a few, each made their mark here. This is a city where on West Kinzie Street even the air smells of chocolate. Chicago’s candy history is as old as the city itself, started by European immigrants who brought with them a variety of Old World candy-making recipes and skills, helping pave the way for Chicago’s industrial candy revolution seven decades later. But even after the rise of the industry giants, pockets of ingenious and resourceful candy craftsmen continued to carve out a sizable niche. Italian immigrant Elmo Lanzi was one such person. Another Lanzi’s candy admirer was Chicago-area businessman Jerry Ostermann, who would take his admiration to another level. In 2005, Ostermann decided to make a radical shift from his successful import/export company into the candy business. Rather than create a new confection, Jerry’s interest was focused squarely on his favorite candy: the Cashew Nut Crunch. Problem was, Jerry hadn’t seen or tasted it since the 1980s. He wondered, like many on candy blogs across the Internet, how a candy this good could just disappear. What happened to Lanzi’s, and how can Jerry resurrect a candy that’s been dead for 25 years with neither the recipe nor the machinery to make it? Award-winning filmmaker Michael Lahey, grandson of Elmo Lanzi, sets out to answer these questions in the documentary Shelf Life. Following Jerry’s quest to recreate Elmo’s most famous confection will take Lahey deep into the heart of both the Chicago candy industry and the Lanzi family itself, and provide a revealing look into how Chicago was transformed into a city of sweets, and why it struggles to maintain its position as Candy Capital of the World. Wonderful post! I had no idea that candy played such a large role in Chicago.